Homeschool Science Curriculum | My Journeys Through Life . . . Herding Cats In New Mexico! We like to add fun subjects like science to our summer studies so I was excited to receive Learning About Science Collection, Level 3 (Cursive) from WriteBonnieRose! I have done one other review of a WriteBonnieRose publication, you can read it here. Also included in our download is a four page pdf with a goodly amount of categorized web links to add in when we want to find out more in a given topic. Each one of the “workbooks” from WriteBonnieRose is around 20 pages in length. 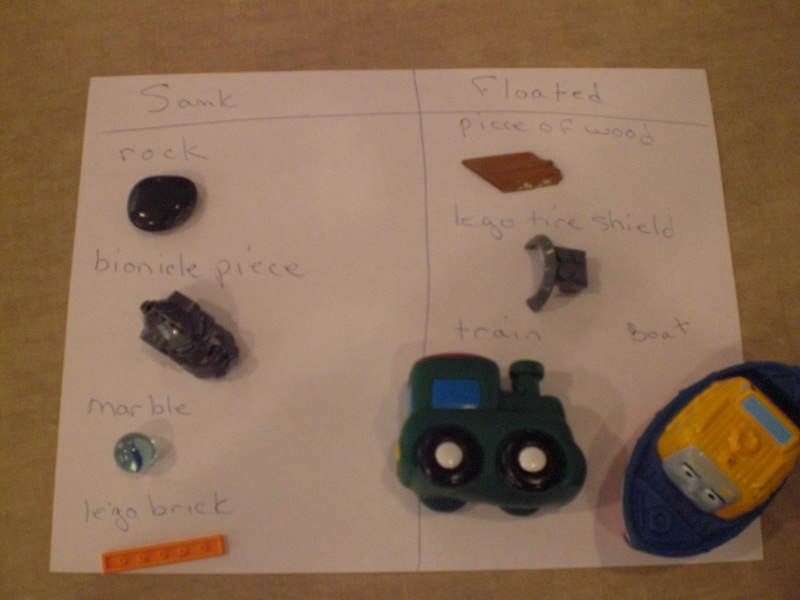 They can be printed out and used as worksheets, bound together as a book, or simple stapled in a top corner, as we did. Eventually, we will remove the staples, and then either 3-hole punch to put all together in a notebook or maybe I will take them to be spiral bound as a complete book. One thing we really appreciate is that these are labeled as “levels,” as opposed to grades. My kids are age-wise older than the third grade, but they have different levels of abilities depending on their individual delays. This was perfect for “The Artist,” because he loves science, and he absolutely prefers to learn in bite sized chunks. Bonnie Rose is a writer. She was never homeschooled, and never had any children. 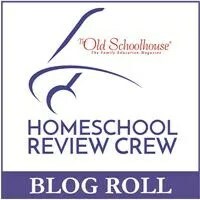 She ended up writing for the homeschool community because she loves children, and is a supporter of homeschooling. Another author suggested that she go to a homeschool convention, where she picked up a free copy of The Old Schoolhouse Magazine. 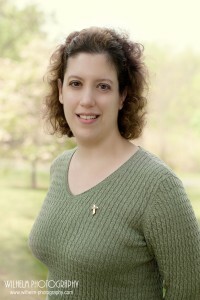 She ended up volunteering to write for Schoolteachers.com, an educational website developed by The Old Schoolhouse Magazine. Bonnie Rose is an excellent writer of educational materials, and I very much recommend her! 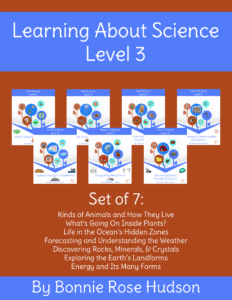 To read about what my fellow crew members think about this and other levels of Learning About Science Collection, please click on the banner just below! Many of you are aware that our boys really, really enjoy things that are, in their words, “science-y”. You may NOT be aware though, that I am NOT a “science-y” type person, so this topic has always been sort of a “learn it as it comes up” kind of thing. Well, being given the chance to review an online science curriculum called Science4Us.com Online Subscription turned out to be something of a God-send! Science4Us.com offers a FULL online science curriculum for your K-2 students. However, don’t let that grade range limit you at all. It can also be used as review for older students. MY kids are having a great time with it! Here is a video of “Mr. Loquacious”, talking just a little bit about the program . . .
As you can see, he tends to lose his “Mr. Loquacious” title when being put on a video, LOL! I feel that this curriculum is very good for either the homeschool parent who wants to set up lessons for their children (or is required to do so by their state), or for the homeschool parent like me, who is more of a “fly by the seat of your pants” type. I do not use a lesson planner, I have never lived in a state which required me to keep records of any kind, which is the way I, personally, feel homeschooling ought to be. 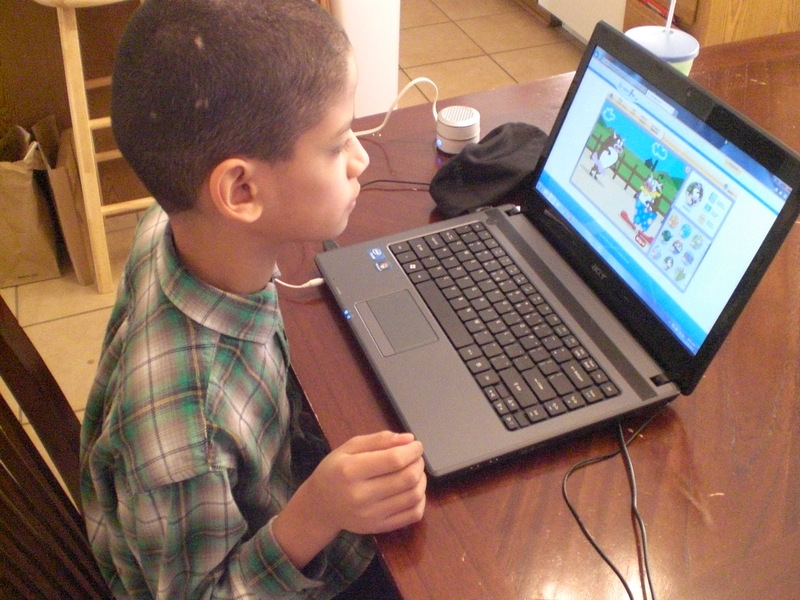 We do a lot of “interest led” homeschooling, and believe me, the Science4Us.com Online Subscription works BEAUTIFULLY for our homeschooling method! Lest you think it won’t be for you though, because you prefer (or are required) to keep records, have lesson plans, etc, this curriculum works for you, too! The Science4Us.com Online Subscription gives you, the parent and/or teacher, well done lesson plans, already prepared for you! The program is set up to allow you to check on your child’s progress, and see what and how they are doing. You have the capability to set specific assignments for your children, and can even set it up with start dates and end dates, or just set the assignment up to end when they have completed it. 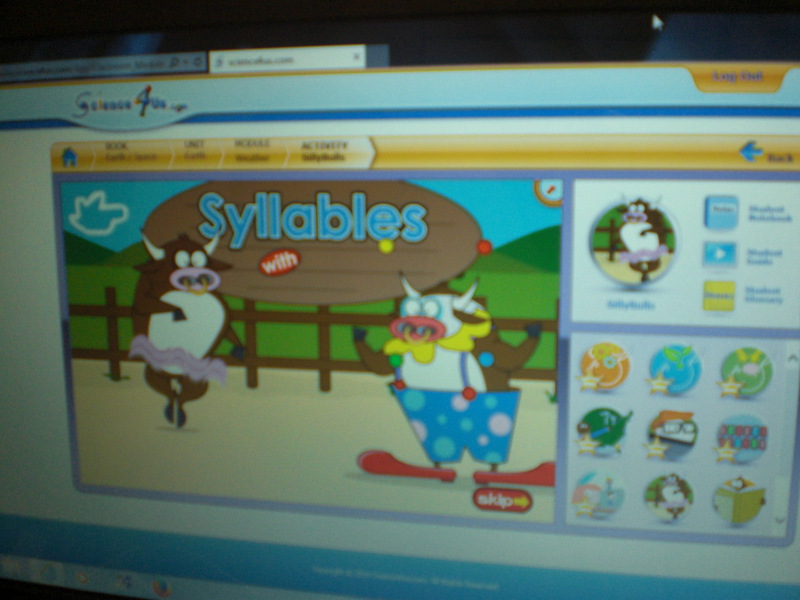 Here is an example of what your child will see after he or she logs in . . .
At that point, they may either choose one of the books at the top right, which my kids did to begin, and then thereafter, they chose from the “recent activity” box, going to the next circle without a star. Here is “The Puzzler”, who, by the way, asks multiple times a day if he can “do the science thing” . . .
And here is a shot of “Mr. Loquacious, also working on his own . . . Your subscription will include a good overview of the following main topics: Science Inquiry, Earth/Space Science, Life Science, and Physical Science, as well as numerous subtopics. I do feel it’s important for me to mention that the Earth History topic does come from an evolutionary viewpoint, and because of that, it was the one limit I put on my kids. We did not use that portion of the curriculum. I allowed them each to choose their main overview topic, and required that they stick with that one until finishing the unit, but other than that, they were free to work on their own, at their own pace. If it is important to you to use a “standards based” curriculum, Science4Us.com Online Subscription states that it falls within that. This is not something that matters to me, but I know that some of my readers do feel it is important. I feel that the price for what you will be receiving is excellent! There are Over 350 Online Lessons, Hands-On Activities and Worksheets, it is web-based, and there will be availability to use it on the iPad in 2014. For those to whom it matters, this curriculum does correlate to state and national standards. 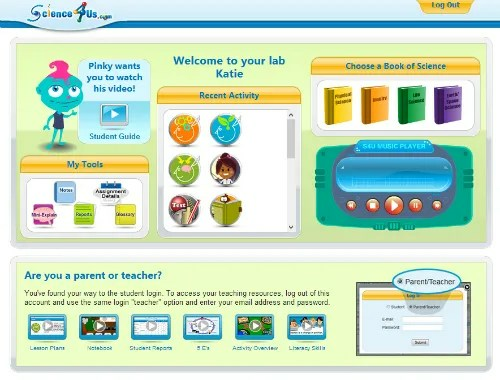 In addition to science, Science4Us.com Online Subscription also helps build math and language skills. Here is a picture I took while “Mr. Puzzler” was working on something that added in language arts . . . 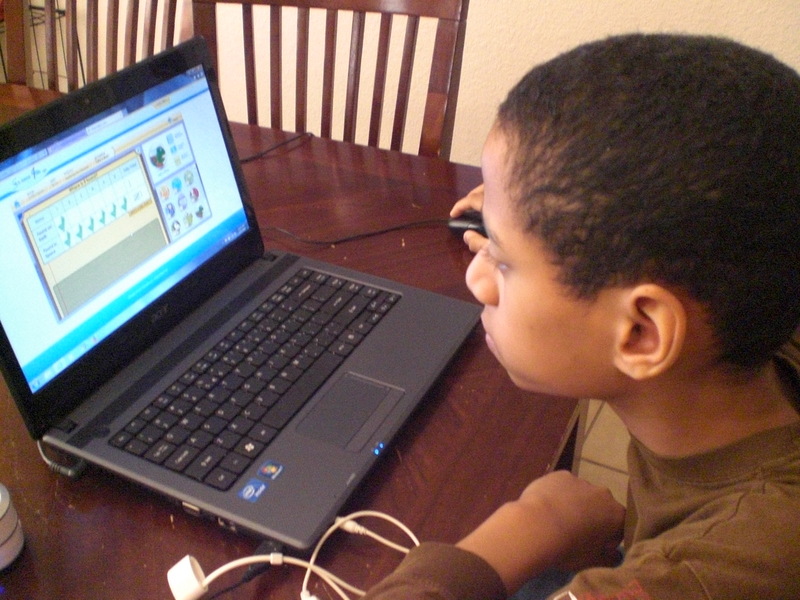 Finally, if you need or want it, there is automated Reporting for Homeschool Portfolios. All of this comes to you for the very reasonable price of $7.95 per month, per child. So far, we are really enjoying our time with the Science4Us.com Online Subscription, and I feel confident in recommending it to you! To find out what my crewmates thought of the Science4Us.com Online Subscription, please click the graphic below! If you are looking for a hands on, Charlotte Mason Style Homeschool Science Curriculum with a definite Christian world view, you will certainly find it in Exploring Creation With Chemistry And Physics, written by Jeanie Fulbright and published by Apologia. This curriculum is written for children anywhere from kindergarten through grade six, and is perfect, in my opinion, for working together as a group, even in a multi-age group. As reviewers, we were allowed to select any two of the notebooking journals which go along with the text book. Because I had hopes that at least one of my kids (“The Artist”) would be able to use the Regular Notebooking Journal, I asked for it . . . Along with a copy of the Junior Notebooking Journal. Because of a mistake in shipping, I actually received two of the Junior Notebooking Journals. Apologia was kind enough to replace the missing journals for those of us who received the wrong ones, and ESPECIALLY kind enough to allow us to keep the wrong ones! In the meanwhile, I was able to acquire two more Junior Notebooking Journals from other reviewers. 🙂 As it happened, this turned out to be a real blessing, because although “The Artist” probably CAN handle the regular Notebooking Journal, he definitely preferred the Jr. one. The Notebooking Journals are very similar, but the Junior Notebooking Journal actually has a lot more in it for someone who likes art, and the Regular Notebooking Journal has significantly more writing to do, something “The Artist” gets balky about if he has to do it with handwriting as opposed to using the computer. One of the best things about the Apologia is that when we use it as a read-aloud (and we do! ), the text is very easy to understand, and there are plenty of good quality color pictures to go along with the text. The 20 Questions Game, which teaches the skill of being able to describe the properties of matter. Figuring out the volume of a small rock using the method discovered by Archimedes . 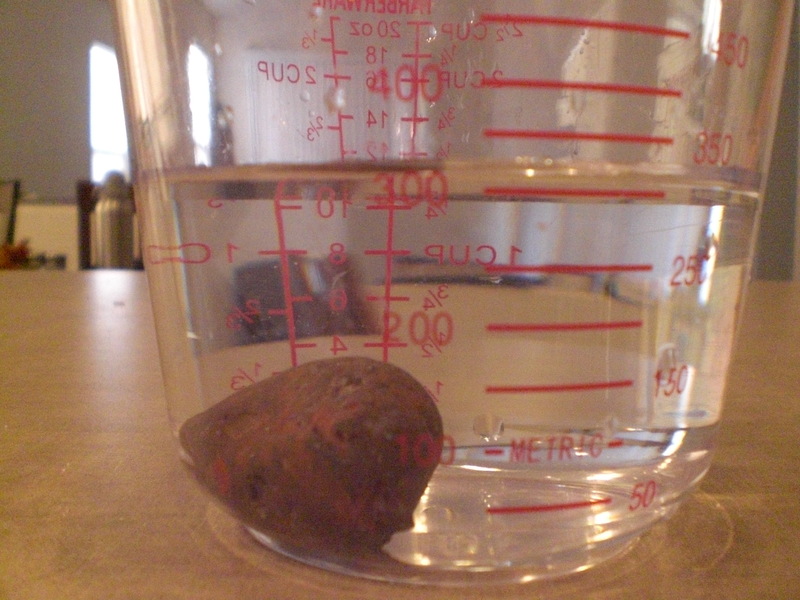 . .
during which we discovered that this small rock from our yard came in at about 50 cubic centimeters. 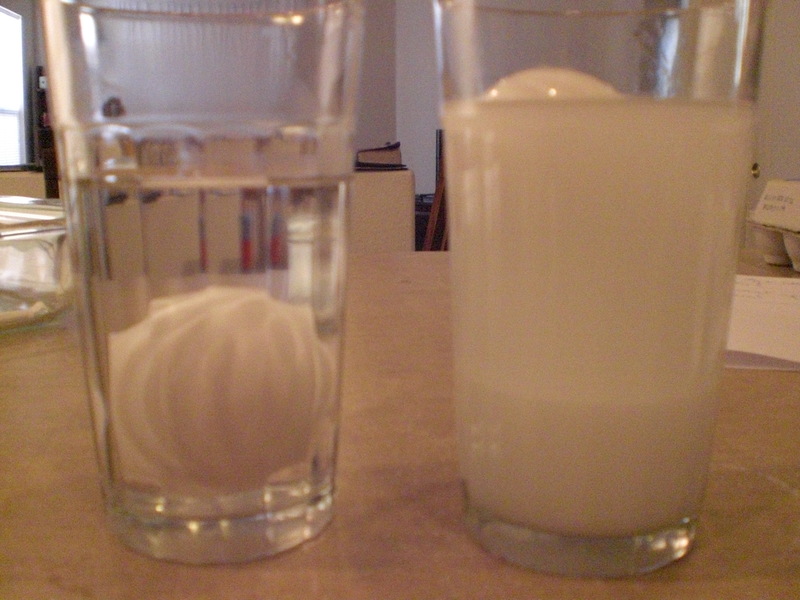 We began learning about density using two eggs, two glasses of warm water, and one half cup of salt . 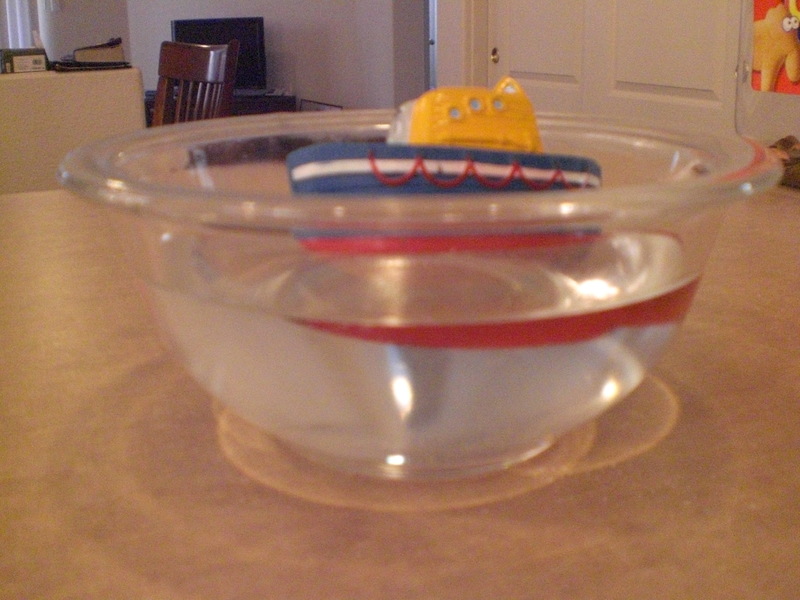 . .
We learned more about mass, volume and density by seeing whether different objects would sink or float in a bowl of water . 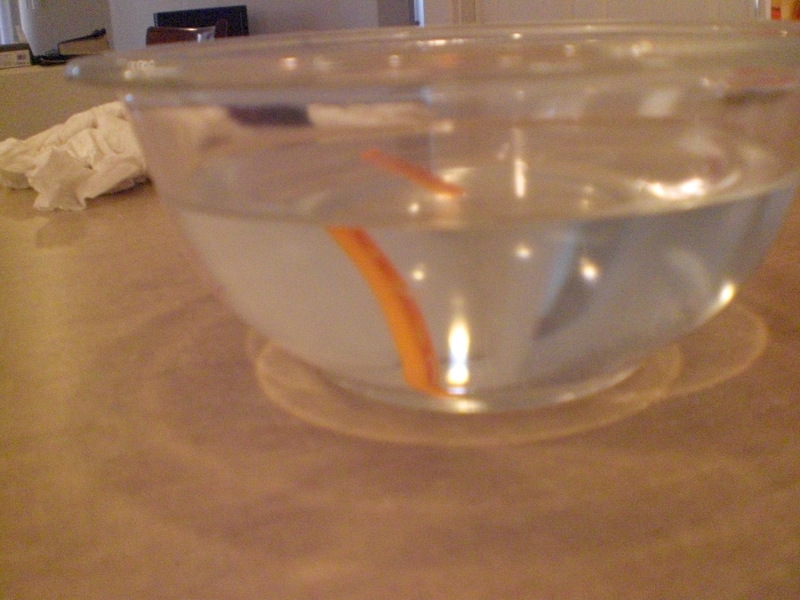 . .
And we also did one other “Try This” to learn about buoyancy. 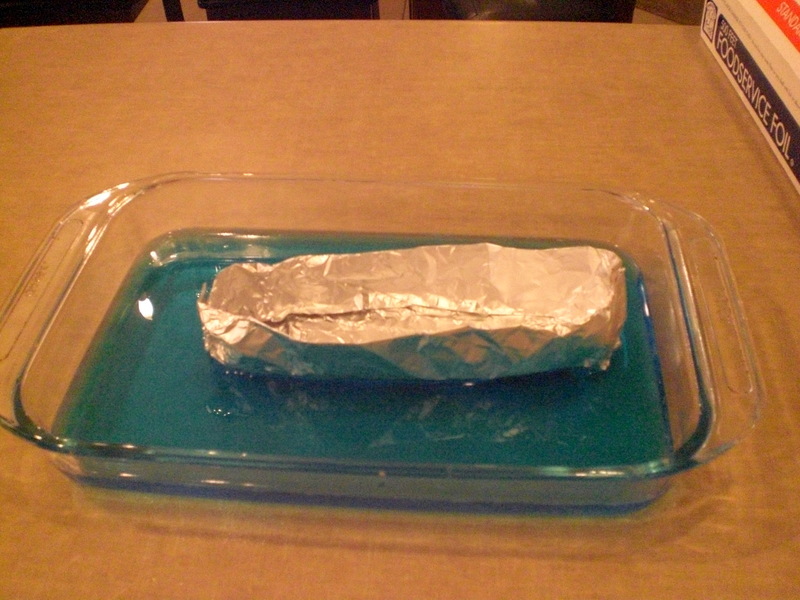 The idea was to build a foil boat, put it into our “ocean” of warm salt water . 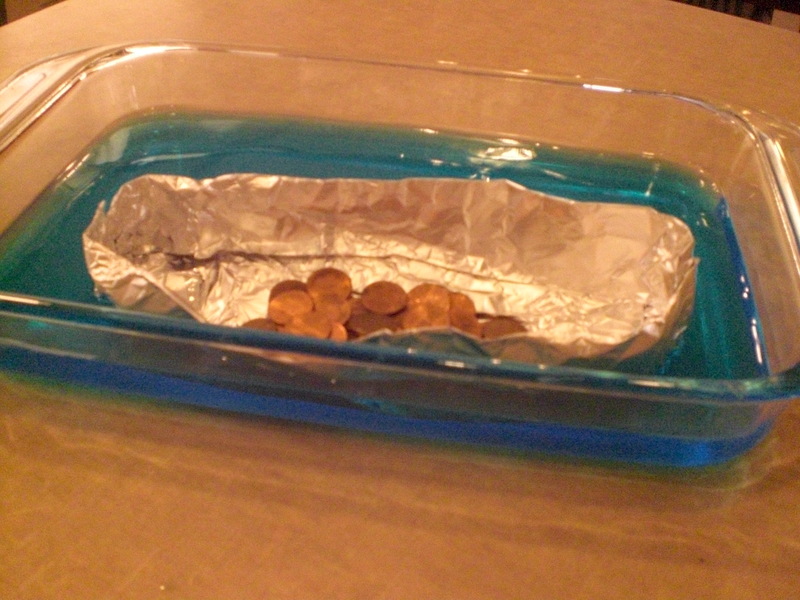 . .
then begin adding pennies (pirate treasure) to see how many it took to make the boat sink . . . In case you were wondering, it took 56 pennies! 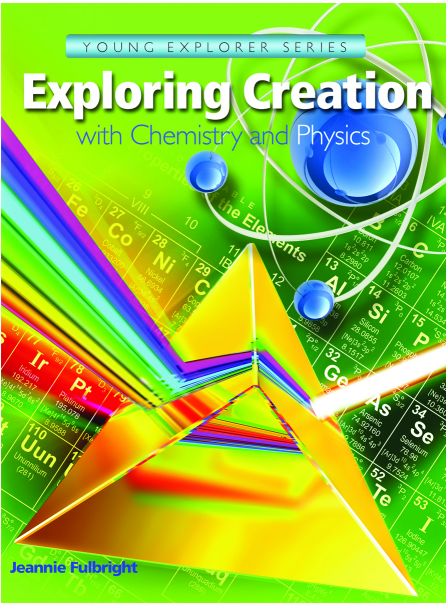 In the main text-book “Exploring Creation With Chemistry and Physics“, there are 14 lessons. 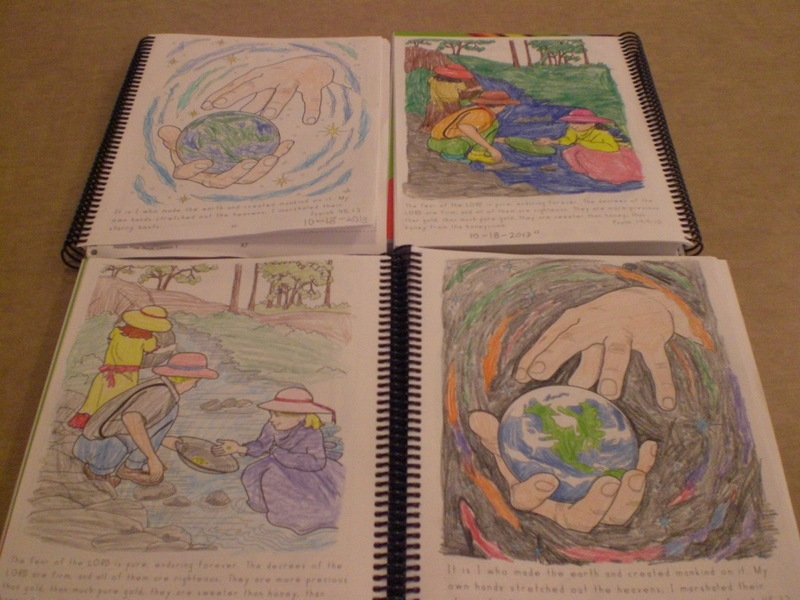 The breakdown of the lesson plans are in the Notebooking Journal and the Junior Notebooking Journal, with the suggested pace of two days per week, doing one lesson per week. As usual, we are slowing this down quite a bit, in order that all of my children can really get as much as possible out of this curriculum. I think that’s one of the best things about homeschooling, the fact that we can go at our own pace, tweaking here and there as needed to accommodate the various special needs my kids have. There are also a multitude of lapbook style things in both of the Notebooking Journals for the student to cut out, fill in, and then glue to the appropriate page of their notebook. We are just getting ready to begin one of them, in fact! 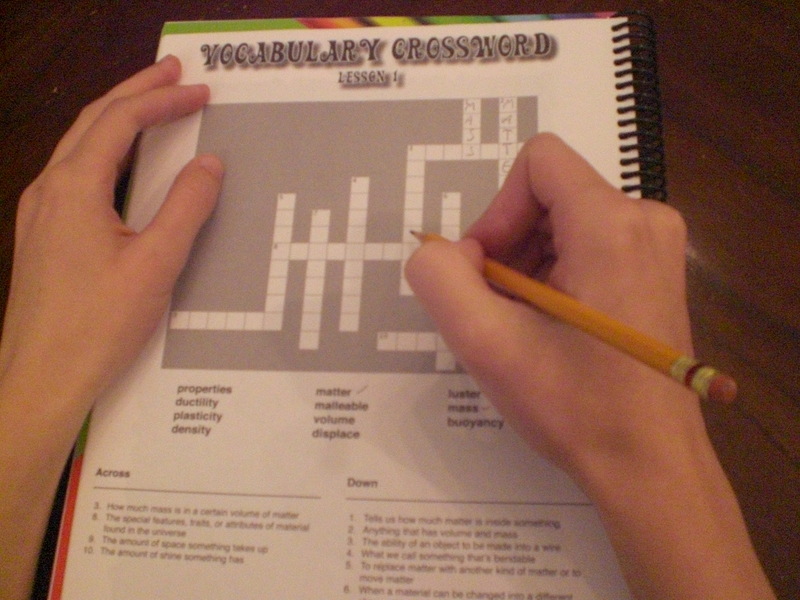 There are vocabulary activities, such as crossword puzzles, word find puzzles, match-up sheets, vocabulary puzzle pieces, etc, and, should you need them, the answers are all in the back of the Notebooking Journal! From the Junior Notebooking Journal, you can see that my kids are not carbon copies of one another when it comes to coloring! Apologia is a good fit for my family, and we will continue to use it, but with one small adjustment in addition to slowing the pace down quite a bit. The only other change I will make is that when they have a copywork page with a Bible verse, I will be having them use our King James Bible, rather than the version used in the curriculum. As my regular readers are aware, that is my one pet peeve with Christian homeschool curriculum, it is mostly written using other versions these days. I would love it if this were offered with the option of being published using the King James Version for those of us who will use no other version of the Bible. In the meantime, I guess I will just continue to adjust for that by typing the verses out from the King James Bible and then adhering them to the Notebooking Journal over the other version. The Textbook “Exploring Creation With Chemistry and Physics” by Jeanie Fulbright can be found here at the cost of $39.00. 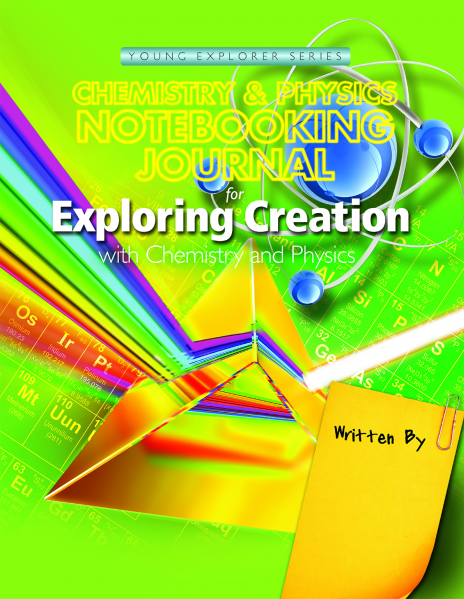 The “Chemistry and Physics Notebooking Journal for Exploring Creation With Chemistry and Physics” can be found here for $24.00. 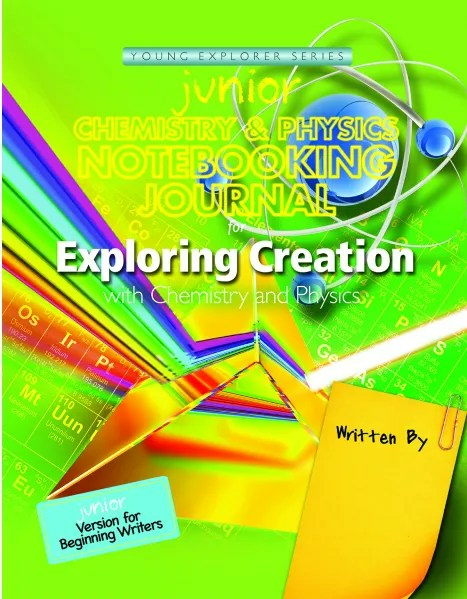 The “Junior Chemistry and Physics Notebooking Journal for Exploring Creation With Chemistry and Physics” is available here for $24.00. 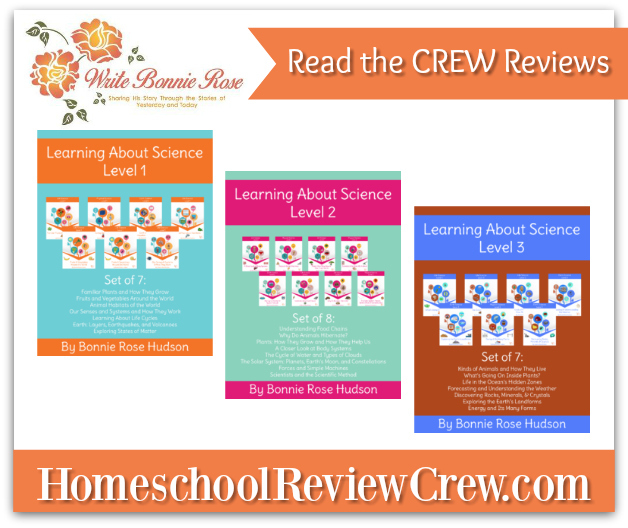 My children and I are very much enjoying this Homeschool Science Curriculum, and I hope you will, too! To find out what other Schoolhouse Review Crew members thought of “Exploring Creation With Chemistry and Physics“, please click on the graphic below!